Gold coloured vinyl. 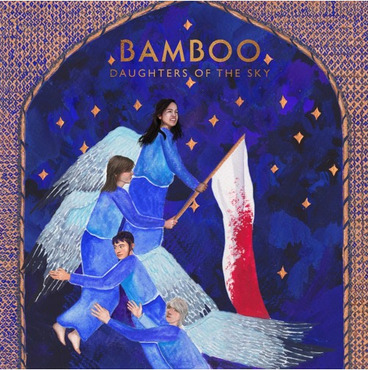 Bamboo (Nick Carlisle - keyboards, production, also of Peepholes / Katy and Nick) and Rachel Horwood (vocals, electric banjo, also of Trash Kit / Bas Jan) release their third studio album Daughters Of The Sky. The album was written and recorded over a two year period where ideas and arrangements were allowed to slow-cook and develop over time, in contrast with the last album The Dragon Flies Away which came together relatively quickly for the duo. The music comprises the usual (for Bamboo) mix of Horwood's flawlessly resonant folk cadence and Carlisle's pristine synth production, whilst TR808 drum machines and samples lock together with acoustic drums, themselves often given the "Tony Visconti" Eventide Harmoniser treatment of Berlin-era Bowie albums. Ancient ARP synthesisers and Mellotron flutes and horns sit next to contemporary digital sounds and samples in a hauntological tapestry over which Horwood can intone her sometimes mournful, often uplifting vocals.